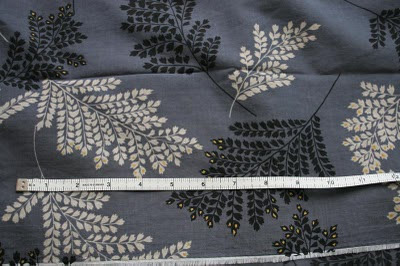 Like many sewists in internet land, I bought yards and yards of Vera Wang fabric when Fabric.com bought up the Lavender Label collection that was never manufactured. Long story short--the 2008 financial implosion caused retail to fall apart as well, many store orders (including Vera's) got cancelled, and she got stuck with a big inventory of fabric. Anyway, I purchased several lovely pieces that will someday become fabulous garments...well, that's my intent at least. 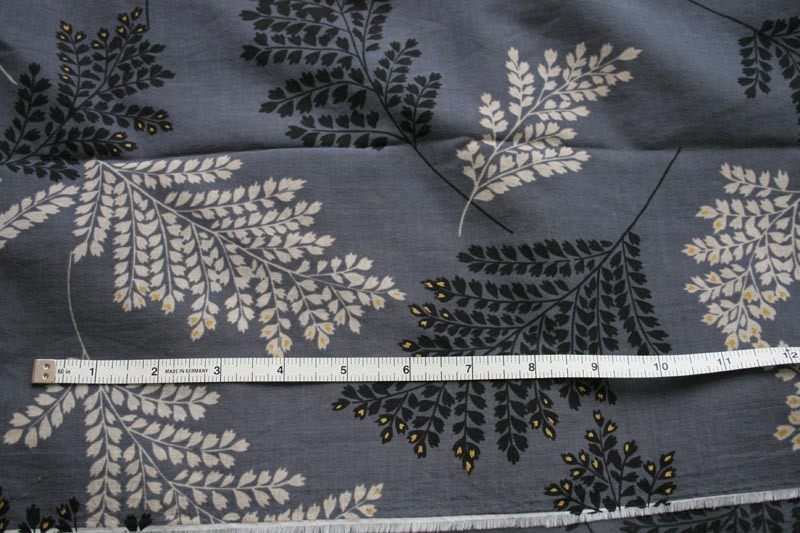 The last piece I bought was some beautiful slate blue print "cotton voile." 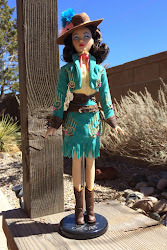 This is a photo that another buyer posted on Pattern Review. Isn't this pretty? I think some people actually got voile, but the piece I got was anything but. It definitely had some synthetic and also had a sheen on the face side. I still liked the print, so I was fine with the fabric being something else. Then proceeded to wash it like I almost always do. When I took it out of the dryer, it was permanently pleated. So it sat in a pile in the sewing cave for several months. Then inspiration struck: how about one of those gored broomstick skirts I like so well? So I lengthened the HotPatterns Bossa Nova skirt by 6 inches and got to work Saturday morning. Needless to say, this is not the easiest fabric in the world to lay out. So I pinned the selvedges together, taped them to the cutting mat, spread out the fabric, and taped the folded edge down. Then I pinned massively all the way around the pattern piece and cut. Here's a photo of the pattern piece being pinned. I repeated the process until I had 8 gores cut out. Then, I sewed the panels together with 5/8" narrow zigzag seams. I tried on the skirt and it was huge. I went to the serger and trimmed off 1/4" on each seam as I finished the edges. I tried it on again, and still huge. I went back to the sewing machine and sewed new seams. Half were 5/8" deep, and half were 1/2" deep. And I tried it on again. Finally, it fit, after removing a total of 9" from the original circumference. The fabric still has some pleats at the hip level, too. The rest was pretty simple. I installed an elastic waistband using the Loes Hinse technique (the original way, not the Hepburn way). And since I had so much practice with the serger rolled edge, that's how I hemmed the skirt. Here's a quick shot of the final project. I may wash it before wearing, just to see if the pleats even out at all. No time right now, but I'll post a picture of me wearing it ASAP. A fairly simple project, although it took a lot longer than expected due to tweaking the vertical seams of the pleated mystery fabric. Still, I learned a lot about working with pleated fabric that I can put to use on some of the rayon crinkles residing in my stash. That looks great! You can probably twist it back on itself when you put it in to the dryer (a la broomstick). 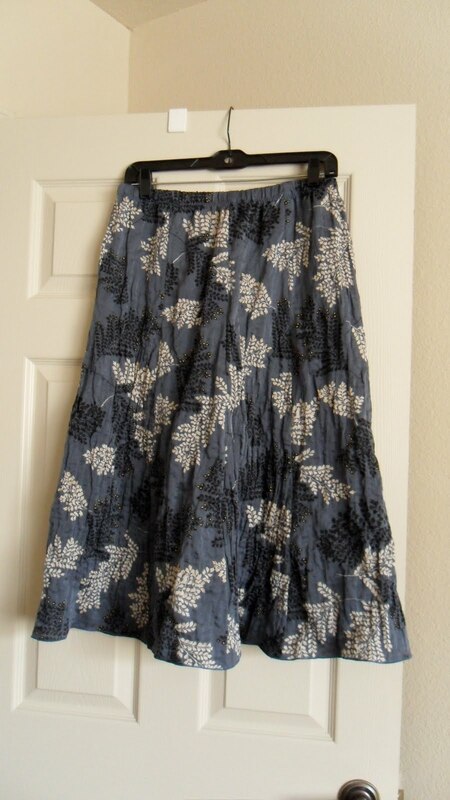 I am soooooo loving this skirt - perfect for hot days and casual days. Great save and cute skirt. I had just the opposite problem - bought crinkled fabric and the crinkles washed completely out. I know I can "broomstick" it as Meredith suggests above, but that's not the point. LOL! So it's back in the newly-culled and organized stash for when inspiration strikes. Great skirt and loved the way you were able to salvage this fabric!! Very nice! And interesting background story on the fabric. Beautiful fabric for a summery skirt! I love it! I just figured out how to do Loes' elastic waistband. I love the technique, especially with thin elastic. It's weightless! You will LOVE most everything about being 'unemployed'...!